It was 11.50pm on Monday night. I was at the computer looking at partially clothed tubby ladies as usual when I saw Mrs Backroads' car coming up the road. She flashed her lights and I waved with one hand and readjusted my attire with the other. Just then I realised she wasn't flashing at me but ushering a small brown calf up the lane. a) Ted - part time farmer and owner of scattered fields around the village who lives in the direction from where the cow was running? b) Ned – psychotic 'git orf my land' type, known to shoot intruders and owner of the field behind Backroads Manor? c) Fred – owner of the local dairy herd and from whom we get our milk? We replied that it was safe in our garden nibbling at our prize lupins. Right, said Fred, I'll be straight down. Like a flash he turned up twenty-five minutes later with Fast Eddie his eldest cowherd and son, by which time, the little cow, stuffed to the gills on lupins and violas had scrambled over our wall into psychotic Ned's field. We told Fred that the cow had escaped from our clutches but reassured him that it was safe in Ned's field and all the gates were shut. 'That's as maybe' said Fred, 'but it's the middle of the night and that's a 30 acre field… and the last time I saw Ned he was shooting all over our lass'. 'Ah…sorry' we said as the little cow disappeared into the inky blackness. …by Tuesday evening, the little calf still hadn't been found. Seems it had gone to ground somewhere in Ned's massive field and no-one in the village was brave enough to trample Ned's corn and risk taking the full force of his weapon in the rear. Until I got home from work that is. Mrs B had been hanging out of the bathroom peering at the horizon through her binoculars (she normally keeps them by the bed as there's often the a chance of glimpsing a nuthatch through the sash window). She reckoned she could see something moving about at the top end of psychotic Ned's field. I pulled out my Canon and poked it's length through the bathroom window and quickly confirmed that there was, indeed, something moving, but that it looked more like a bin-bag caught on a fence, but I was happy to go and investigate. Taking my life into my hands I entered Ned's enclosure. This week's copy of Heat tucked down the back of my pants to protect me from buckshot, I began the long trudge through the corn to the top of the field. Ten minutes later I emerged at the other side of the field looking significantly more Worzel-like than I when I'd set off. The good news was though, it was no bin-bag, but our little calf. The bad news was that it had befriended another cow and calf through the fence into the next field… also belonging to crazy Ned. I alerted Fred the Milk to the little tinker's location and scrabbled my way back home through the edge of the crop, feeling that the mystery was at least half resolved. I arrived, clothes covered in thistles and the copy of Heat had left a sweaty tattoo of Colleen McLoughlin on my bum (I will never wash it again). Mrs B, evidently quite keen on rumpled farm-boy chic put down her ironing and expertly defuzzed my crevices on my return. …and that's where we currently stand. Somehow the calf needs to be magically levitated out of Ned's field and delivered back to its fretting ma. Whether that can be achieved without some sort of incident ending up halfway down a page of Ceefax is anyone's guess. 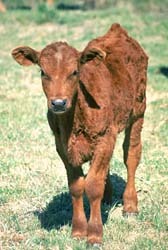 Addendum: Calf recovered at 10.50pm last night. We have been awarded a free pint of semi.